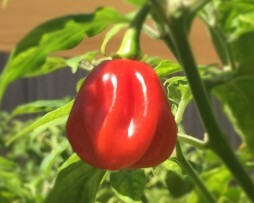 The Pseudonaja was created right here in Australia by the EACSE Face book admin team It is a cross between a Red Savina and a Red Bhut Jolokia. While being grown on here in Townville it turned from the original red to a chocolate colour. It was then that the page had a naming competition and it was named by James Raumaewa as the Pseudonaja! 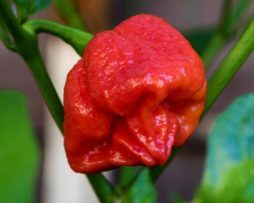 While not tested, its heat is at least that of the Bhut Jolokia. It has a great fruity smokey flavour making it perfect for something like a steak chilli sauce! 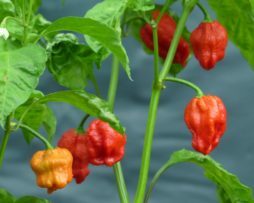 It has inherited the shoulders of the red Savina and the taper of the Bhut which makes the shape quite unique and definitely an eye catcher! The mythical Purple Reaper is here! 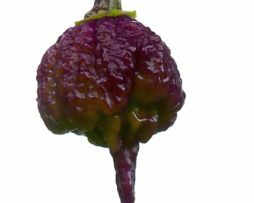 This reaper variety was created by the amazing chilli grower Carlos Jnr from Brazil. We have been looking forward to this one for a long time and we know you guys have too! Ok, we know it’s not completely stable yet but that doesn’t mean it’s not fun to grow, right? Having said that, the pheno is surprisingly good and you will get a lot of great purple pods with awesome stingers which will eventually ripen to red. We know what you are thinking and YES, the Purple Reaper IS Unbelievably HOT! So hot we thought being burned at the stake would be a pleasant alternative. These will go fast so don’t miss out! 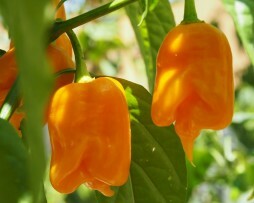 This is a relatively rare and very hot Chilli pepper that has a great flavour to boot. 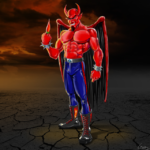 SBS Demon is said to be a cross between Red Dominica with a Guadalopue Habanero. This chilli is known for its slow and long lasting burn. The plant produces good amount of unique shaped large thin pods. They have an awesome spicy habanero type aroma and flavour! 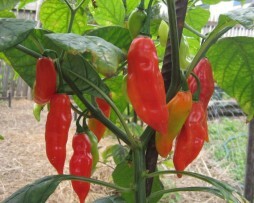 The plant will produce heaps of beautiful hot fiery pods for months and they are very easy to grow. 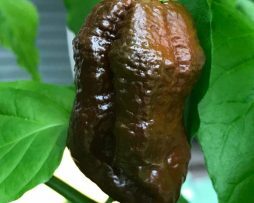 We’re told this is a creation of SilverSurfer on The Hot Pepper forum and is a cross between a 7 Pot Douglah X Trinidad Scorpion ButchT. Holy Smoke Batman that has to mean business. It has a mahogany deep brown hue to it and is crazy golf ball size. Pods have a great gnarly shape and are quite thin walled. It has a slightly sweet earthy flavour and packs a punch heat wise. We think these would be best made into a powder or sneaking into your mates sandwich. This generation is F7+, meaning that it is a relatively stable variety. The Star of Turkey is a very uncommon chilli pepper with a mild tomato like aroma. 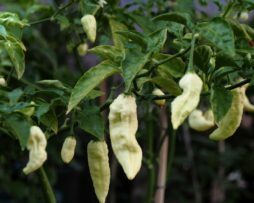 It’s the only C. Chinense type chilli that is actually shaped like a star although the shape is a little different from plant to plant. Its very fleshy pod is sweet and super crunchy, almost like an apple! The heat builds up to a similar level of the Habanero. 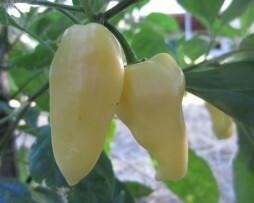 This is a rare chilli and well worth growing. 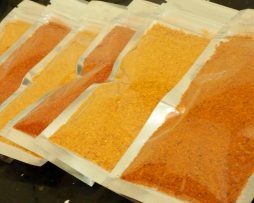 Introducing our range of superhot chilli powders available in pouches of 30gms(Approx 20-30 pods per pouch). Blended without the seeds to a smooth silky powder we have 3 colour varieties to scorch the taste buds. 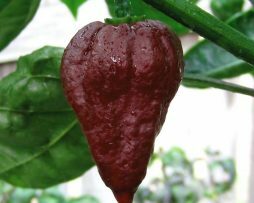 Reaper Red is our top seller and is a deadly blend of Red chillies the like of Reapers / Morugas and Bhuts. Orange BOC is a blend of mostly Bhut Orange Copenhagen chillies and is our personal favourite (just as hot as our Reaper Red Mix). Lastly and our favourite for colour is our Yellow Mix comprising of mostly Trinidad Scorpion and Brainstrain Yellow Blends. No extra postage is charged on these pouches so there are no surprises at the checkout. We guarantee fresh vibrant chilli powder that goes a long way due to the killer heat they pack. 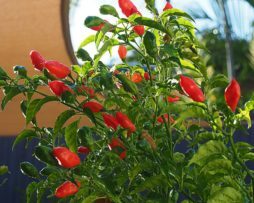 An absolute must grow variety if you like to make fermented Tabasco like chilli sauce. We have permission from our friends over at The Hippy Seed Company to sell their amazing Tabanaga Hybrid which they created in 2009. It’s a Tabasco crossed with a Dorset Naga so you know it has to pack a punch and taste great too. Also if you like your chillies hardy, easy maintenance and super producers this is the one for you. The pods are about 5 cm long and 2 cm wide, start off green and end up a fiery red. The fruit grow to around a meter tall in a pot and much bigger if you plant in the ground.